Even though interior trim doesn't cover much space compared to walls or ceilings, it's a small thing that really calls big attention to itself. Window sills are where you place your morning cup of coffee; door casing you pass a million times a day as you go from room to room. It's usually close-up and closely examined, and that's just the visual aspect of it. It also has to perform. ﻿Have a dog? Then you'll know that they love to stand on hind legs--front paws on the sill--to check outside activity. If you have kids, you'll know that door trim gets bumped all the time. Since these are such high-impact areas, there are special trim paints you should buy for these critical surfaces. Sometimes paint companies helpfully title it "trim paint," but usually not. That's because, like so many other types of niche products like ceiling paint, it's a formulation that, due to its properties, could work in a number of places. The only reason why it might be labeled "trim paint" is to make it easier for consumers to identify. Trim paint falls within the category of interior paint, with a gloss of satin, semi-gloss, gloss or high gloss. In the paint's specifications, companies may say that the paint is suitable for trim, cabinets, doors, furniture, and windows. Trim paint usually comes pre-tinted in bright white and in base colors that can be custom-tinted. Avoidance of Brush Marks: Nobody likes seeing brush marks on their trim. By its very nature, oil-based paint helps to level out brush strokes (its longer drying times help the paint settle). Acrylic-latex paints do show brush marks. The flatter the sheen, the less visible the brush marks will be. Gloss: Gloss is an important feature in the trim paint. Glossier paints have a tighter molecular structure, meaning smaller pores for dirt and other debris to work into it. Thus, there is no designated flat or matte trim paint. Trim paint finish glosses are satin, semi-gloss, gloss, and high gloss. Sag Resistance: Paint sags don't happen as readily when the paint is thinner and can be rolled on. The brush-painting--your method of paint application for trim--means that big globs of paint may develop and sag before drying. Thicker consistencies of paint help prevent sagging. Non-Yellowing: Most trim gets painted white. Window trim, in particular, gets blasted with the sun, which can yellow the paint. That's why many paint companies advertise non-yellowing properties with their pre-tinted white trim paint. In a sense, this is the classic trim paint. If you have a house that is at least a few decades old, chances are good that the trim was painted with oil-based paint. 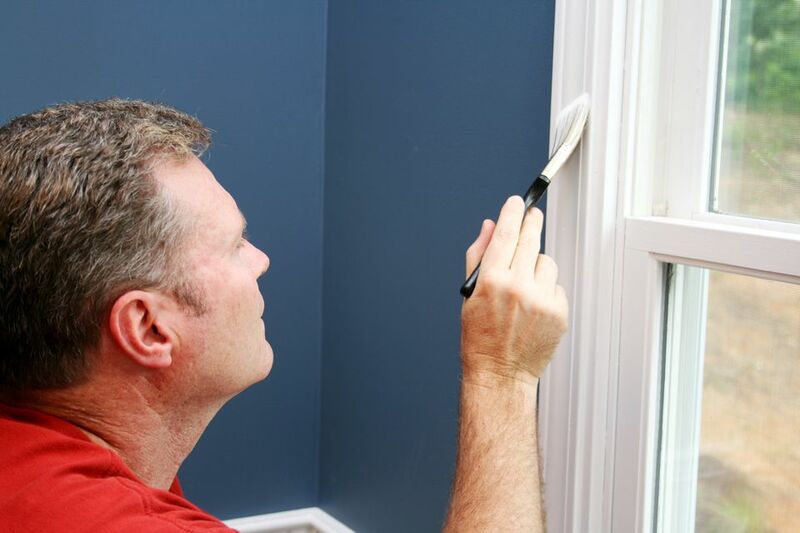 Oil-based trim paint gives superior, glass-like finishes, with minimal-to-zero brush marks, but at the cost of slow drying times, fumes, and solvent-based clean-up requirements. Because of its thick consistency, it's good at filling in minor holes. Due to laws passed beginning around 2000, many localities now ban oil-based paints in sizes above quarts. Only use a brush with natural bristles, as the oil formula will affect synthetic bristles. Oil-based paint can be difficult to use, especially since you must use petroleum-based solvents to clean up afterward. Water-based paint can produce a good finish and minimal brush marks, but not nearly as good as oil-based paint's properties. Brush marks will be visible. The surface will not have the rock-hard shell texture of oil-based paints. Water-based trim paints afford easy clean up with soap and water. Use either synthetic or natural bristle brush. Use a paint comb to aid in clean up. Behr: Premium Plus Ultra Interior Semi-Gloss. Enamel. Soap and water clean-up. Benjamin Moore: Regal Classic Premium Interior Paint - Semi-Gloss Finish. 100% acrylic resin. Soap and water clean up. Dutch Boy: Cabinet & Trim Interior Gloss Paint. Enamel. Glidden: Trim and Door Paint. High Gloss. Oil-based. Solvent clean-up. Olympic: ICON Interior/Exterior. High Gloss. Soap and water clean up. Sherwin-Williams: ProClassic Acrylic Latex. Soap and water clean-up. Valspar: Ultra Paint + Primer. Acrylic latex. Soap and water clean up.